Eastburn and Gray Proudly Supports 2018 Summer Camp Scholarships on Giving Tuesday - Eastburn & Gray, P.C. 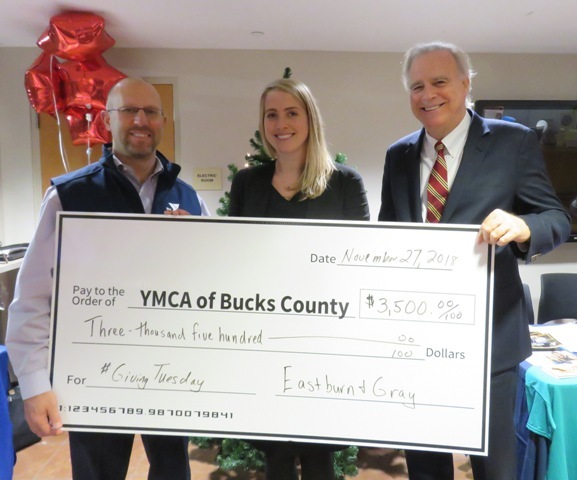 On Tuesday, November 27, 2018, Eastburn and Gray presented a check to the YMCA of Bucks County in support of the organization’s summer camp programs. The sponsorship supports children and youth who are vulnerable and dealing with numerous challenges related to poverty. Photographed above are Zane Moore, President/CEO of YMCA of Bucks County and Eastburn and Gray attorneys Sarah A. Eastburn, Esq. (Board member of the YMCA of Bucks County) and D. Rodman Eastburn, Esq. The YMCA of Bucks County is a charitable non-profit organization that focuses on youth development, healthy living, and social responsibility to strengthen the community and help individuals, families and communities learn, grow, and thrive. To learn more, please visit www.ymcabucks.org.